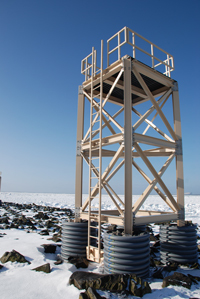 Strongwell’s Fiber Reinforced Polymer (FRP) products were recently used by Wade Perrow Construction, LLC (WPC) for a Seal Observation Facilities Project on St. Paul Island, Alaska. WPC was in need of a low maintenance, high strength material to replace the rotten wooden towers and walkways. These structures were deemed unsafe for the observation of northern fur seals in the corrosive, arctic salt water environment. WPC has been awarded the Associated General Contractors of America’s Aon Build America Award for Best Renovation of a Federal and Heavy Construction Project for the St. Paul project. WPC found that the corrosion, rot and low temperature resistant qualities of Strongwell’s EXTREN® and SAFRAIL™ products proved to be an ideal replacement for the wooden structures and walkways. To ensure that the seals were not disturbed, WPC had to work during the winter months when the seals were not on land. The ease of installation allowed the FRP materials to be quickly assembled even in the midst of extreme sub-zero temperatures and high winds. This led to the project’s completion a year ahead of schedule. The FRP products also preserve the beauty of the surrounding area. FRP brought numerous other advantages to the customer as well. The products were easy to ship, install and maintain; and available in custom colors.